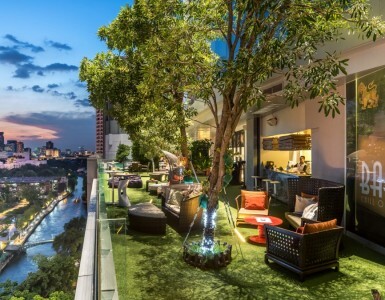 It simply is a fact that location is key when talking about where to stay in Bangkok! Depending on what your purpose for visiting the “Big Mango”, picking the right area to be your home base is of great importance in making your stay the best it can be. Novotel Bangkok Platinum Pratunam shines with its key location right in the middle of the Pratunam district, offering a glimpse into this bustling wholesale fashion hub that is right next to trendy Ratchaprasong district and its high-end malls, hotels and lifestyle centers. You are also in the right location to enjoy delicious and authentic street food from the hawkers of Pratunam, while still having the chance to relish high-end hotel delicacies. Worried about getting around in Bangkok? Transportation is a breeze, with options ranging from experiencing the canal boats zipping on their daily routes or a simple hop on to the hotel’s free tuk tuk shuttle service to the next BTS station or the nearby shopping destinations such as Pantip Plaza (heaven for IT aficionados), CentralWorld, Siam Paragon and more. For more extensive trips, the airport link is a brisk walk away and the hotel is close to major expressways, with the concierge team on hand to assist with any travel arrangements. After a long day of sightseeing, shopping or business, that feeling of relief when you return to your room is key, and at Novotel Bangkok Platinum Pratunam each of our 283 modern rooms is designed with your comfort in mind! Free wifi in every room and the public areas of the hotel keeps you connected, and you can choose to surf the internet and enjoy our lunch buffet promotion at the Square Restaurant or chic Platinum Lounge on the 6th Floor. Or, head up to the 9th Floor, with the garden-party rooftop flair of BAR9 as well as the inviting infinity pool and amazing views of Bangkok’s skyline. The 9th floor is also home to InBalance Fitness and InBalance Massage by Novotel, ready for guests looking for some exercise and rejuvenation when on holiday. Need more exclusivity? Guests staying at the Executive floors get access to the Premier Lounge on the 24th floor with exclusive breakfast buffet, all day refreshments and evening cocktail and canapés happy hour. Whether it’s the perfect location well-suited for both business and leisure, the countless shopping and food tasting opportunities or the well-appointed rooms, inviting outlets and conveniences throughout the hotel, when you ask the question where to stay in Bangkok? The answer has got to be: Novotel Bangkok Platinum Pratunam!